Natural Anti Aging Care: 7 Holistic Health Habits = No Wrinkles + Younger Look - Due to the advanced medical science of these days, life expectancy for all races and sexes has benefited greatly. Needless to say why people become interested in living long and healthy. As a result, a whole industry is dedicated to longevity, diets, enzymes, hormones, and what not to reduce aging. Interestingly, but some of the marketed products work; while others only promise eternal youth. There is, however, a list of natural but scientifically supported techniques. Actually, each of them helps to fight both the symptoms and appearance of any aging process. Certainly, none of us can stay young forever. Still, any of us must try to live healthier, happier and younger, as long as possible! Sleep is the 1st natural skin care habit you’d incorporate. The lack of it leads to poor skin tone, dark circles under puffy eyes, breakouts and wrinkles. A good quality sleep is your clear, young and blemish-free skin. Water is essential for optimal function of all organs, your skin in particular. Being well-hydrated means to drink at least 8 glasses a day. Sun Damage is probably the biggest cause of premature aging. On the other hand, we all need exposure to ultraviolet radiation. This stimulates the production of vitamin A, for example. But too much UV accelerates the appearance of wrinkles, by destroying collagen and elastin. By the way, the sun’s external aging is called ‘photoaging’. So, be careful, because harmful rays are able to penetrate your skin even in cloudy weather. Good advice here is to choose a daily moisturizer with sunscreen. Besides, it’s important not to stay out of bright sun during the peak hours, wear hats, cover the skin with clothing, drink green tea, etc. Exercise is another natural anti aging skin care habit. In fact, exercises seem to be the perfect answer to all life’s problems, skin in particular. When exercising, your circulation and blood flow increase. Thus, you’re given a radiant glow look. Furthermore, obvious signs of aging are stooped posture plus trembling limbs of the elderly. It is the result of a muscle mass loss, leading to sagging facial skin and its tissue droops. Luckily, this can be reversed through your weight training. Eating Right slows aging and protects your skin from damage. Some foods have been combating the age for centuries, due to contained nutrients. Who doesn’t know the free radical theory of our aging? Well, our bodies wear down because of cellular destruction by molecules and atoms, or ‘free radicals’. Here is where food with powerful antioxidants comes in. Remember that the more of them are consumed, the less damage to skin cells will be. So, you are recommended to get a diet rich in colorful fruits & vegetables, trout & salmon, and other beneficial foods. Stress is something between your mind and body. Geneticists found that chronic stressful lifestyle accounts for damaged cells. As a result, tissues and organs begin to die! Just reduce stress, and this will be your perfect internal anti-aging technique. There are a number of such reducers that require no pills or medical intervention. Most physicians recommend an exercise regimen, which is a fundamental method against stress. This is high time you boosted self-confidence, released pleasure-inducing chemicals and felt a sense of well-being! Alcohol & Smoking have nothing in common with beautiful and young skin. It really suffers, if you drink and smoke too much. Those toxic chemicals constrict capillaries; cut off circulation and oxygen supply; damage collagen and elastin; accelerate sagging and wrinkling, etc. What else could you ask for? That’s why, one of the best things is to quit smoking and drinking. Natural skin care products can also turn back or just slow your progress of aging skin. There are tons of ‘best solutions’, which are advertised in magazines or television ads. And, it’s hard to resist their claims. After all, who doesn’t want fewer lines and a young glow? Despite anti aging products seem to be the most popular, natural ingredients are used very frequently too. The key advantage is no harmful or toxic ingredients, as well as no animal testing. So, you are lucky to try many choices available. Sort through the best options and find your own skin care routine that really works! 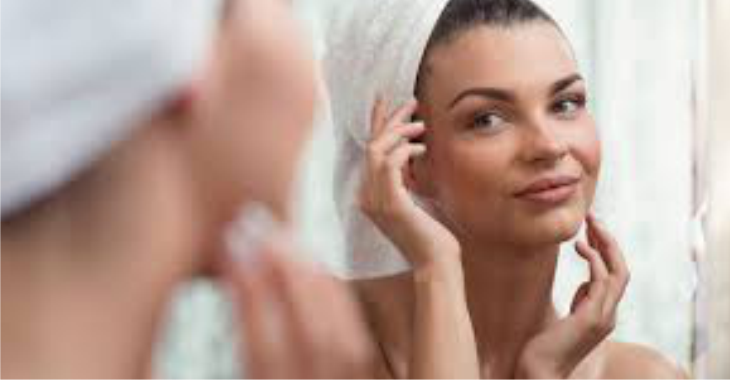 In addition, do not forget to take care of your skin, by learning the daily basics: cleansing, toning, moisturizing, protecting, and exfoliating. A multi-task facial mask is always a good idea. In short, this is a simple and effective external routine for your anti-aging process. All in all, go natural!